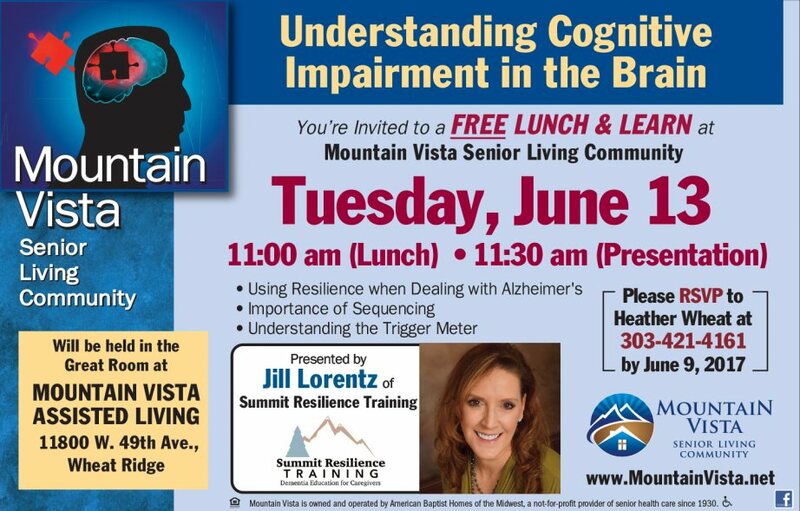 As a premiere memory care provider, Mountain Vista Senior Living Community will be hosting a free and open-to-the-public Lunch-and-Learn event, “Understanding Cognitive Impairment in the Brain,” presented by Jill Lorentz of Summit Resilience Training, on Tuesday, July 13 at the community. In the early 90’s Jill’s mother was diagnosed with a form of dementia. The onset of her Mother’s condition led Jill to learn about the disease and shaped her career, and she launched Summit Resilience Training. The company provides education and training to families and healthcare professionals in the area of cognitive brain conditions. Jill not only offers education and training program, she is also the host of the weekly radio program, Dementia Resilience, on 1430 am radio. During this presentation Jill will outline techniques and steps caregivers can use to help manage and support those with memory concerns to overcome obstacles, manage adversity and find positive outcomes. Mountain Vista is proud to partner with Jill and help support the people and families who live with and manage memory and cognitive issues. Attendees are asked to RSVP in advance to Heather Wheat at 303-421-4161 by June 9.